Giant Tube Creature Caught On Camera Under The Sea. Well, it’s not an underwater sea slide you’re looking at. 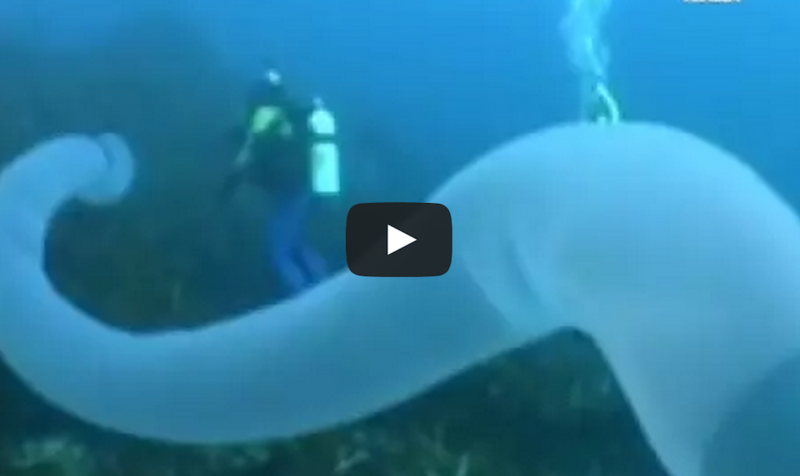 This large inflatable tube looking thing is actually a Pyrosome. And what it carries within it’s tubelike body is even more shocking. There are many hundreds or thousands of animals called Zooids embedded in its gelatinous tube. “One long Pyrosome is actually a collection of thousands of clones, with each individual capable of copying itself and adding to the colony,” writes marine biologist Rebecca Helm in Deep Sea News. The footage below was captured by Eaglehawk Dive Centre in Tasmania, Australia. OMG! This Man Sits On A Floating Whale Carcass While Sharks Feed On It!